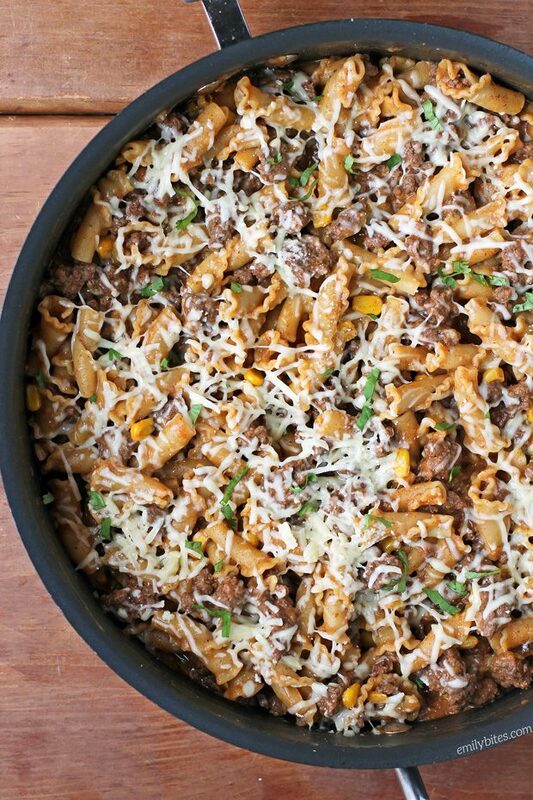 This one-pan Beef Enchilada Pasta Skillet is so easy and full of flavor – perfect for a weeknight dinner everyone will love! As soon as I made this dish I knew it was going to become one of the go-to meals I make over and over again. A filling, 1 ½ cup serving is just 378 calories or 9 Weight Watchers Freestyle SmartPoints and no one will ever believe you that it’s lightened up. The creamy, spicy enchilada sauce perfectly coats the seasoned ground beef and pasta and I love the sweet bites of corn throughout. As is, this pasta has a little zip, but you can easily adjust the heat to your preference by using a milder or hotter enchilada sauce or adding more or less green chilies. 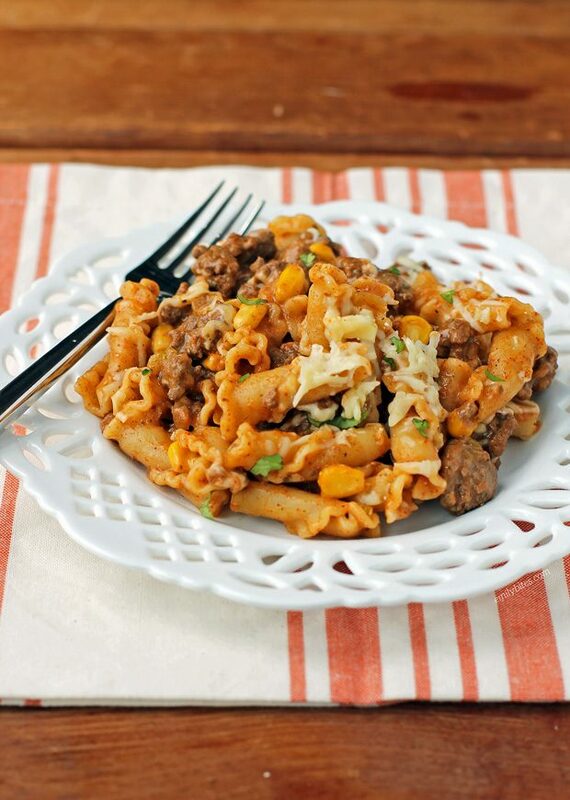 This Beef Enchilada Pasta Skillet is one of those meals that kids and adults will both love and it’s so easy to make, you’ll definitely want to add it to your regular rotation. Plus, there’s only one pan to wash! Just pair it with a salad or veggie side and dinner is served. It even makes great leftovers (if you ever have any)! If you prefer, you can even substitute ground turkey breast for the beef to lower the SmartPoints on Weight Watchers Freestyle. Looking for more tasty, lightened up pasta options? Check out the pasta section of my recipe index for favorites like Beef Stroganoff, Beefy American Goulash, Slow Cooker Kickin’ Chicken Pasta, Beef and Sausage Manicotti, Pumpkin Alfredo Tortellini Skillet, Spinach and Artichoke Lasagna Roll Ups, Chicken Cordon Bleu Pasta Bake, Tomato Soup Mac & Cheese, Spaghetti Pie, Sausage Tortellini Skillet, Buffalo Chicken Lasagna Roll Ups, Chicken Parmesan Stuffed Shells, Spicy Sausage Pasta and many more! Optional: I sprinkled a bit of chopped cilantro over the top, feel free to do the same! Place the ground beef in a large saute pan or walled skillet and bring over medium heat. Cook, breaking up with a wooden spoon, until the beef is browned and in smaller pieces. Sprinkle the beef with the chili powder and cumin and stir. Add the onions and chilies and stir together. Cook for another 3 minutes until the vegetables are softened. Add the chicken broth, enchilada sauce and pasta to the skillet and stir together. Flatten so that most of the ingredients are covered by the liquid. Turn up the heat to bring the mixture to a boil. Once the sauce is bubbling, reduce the heat to low and cover the pan. Simmer covered for 10-12 minutes. Remove the lid, add the corn, stir and re-cover. Cook for another 2 minutes. Remove the lid and stir the ingredients. Pasta should be cooked and most of the liquid absorbed with only a sauce remaining. Remove from heat and stir in the sour cream and 1/3 of the shredded cheddar until well combined. Sprinkle the remaining shredded cheese over the top of the pasta and cover with the lid. Let the skillet sit covered for 2 minutes until the cheese on top has melted and then serve. This looks sooo good! My son and his girlfriend are coming to stay with me this week and this will be a perfect “cook ahead” dish that I’m sure we all will love. Keep ’em coming, I love your recipes! YUMMY!!! I bet my crew would like this. Thank you SO MUCH for approximate serving size. This is not so easy to figure with many recipes and is kind of important if you are counting the SmartPoints. Love your recipes!!! This looks so good, totally going on my meal plan for next week! Thank you, Emily, for another wonderful recipe! I just made it and it’s delicious (and easy to make too). I love one pot meals and this one has a nice flavor profile. We love anything enchilada, this looks SO good! Can’t wait to give it a try! This is really, really good!! Will definitely become a regular dish in this house. Made this last night- turned out soo good and it was easy! I tried to make a vegetarian version of this with red beans, black beans, and Morningstar crumbles. It tasted good, but I ended up having to add flour to it to thicken up everything (otherwise it was watery). Any tips? Thank you! Emily- again, you’ve made a delicious, family-friendly meal. I opted to use the lean ground turkey breast instead of beef that you noted when I made it last night. It’s very filling and is definitely going in my rotation! Made this last night and we loved it! This was delicious And so easy! I added black beans and garlic, because I used ground turkey and I worry that turkey can be flavorless. But this was fantastic. Thank you! Making this again tonight. It’s on my weekly meal rotation now. Love this recipe. Thank you so much for sharing. This was delicious. It received rave reviews from my husband and company over the weekend. No leftovers, darn it. I made this tonight! I used a little less ground beef and subbed in daiya cheese AND it was still AMAZING! Made this today and it’s delicious! I used ground turkey, and next time I’ll add black beans – for color if nothing else! This has been on my list for a while and we finally had an opportunity to make it! The only thing we did differently was we used taco seasoning in place of the chili powder and cumin. We both thought we had chili powder and tore apart our spice rack…nope. Definitely picking some up on our next trip. Anyway, this was soooooooo delicious!! Definitely keeping this one around, thank you for sharing Emily!! I made this tonight, but instead of using ground beef, I used shredded boneless/skinless chicken breast (had some left over when I made the chicken chili earlier this week), but followed rest of the the recipe as instructed. I was worried my family wouldn’t like,it, but they LOVED it. It was really good – definitely a keeper. Oh. My. Goodness. This was so good — so satisfying and a very generous serving size. I am so happy that I get to eat this again tomorrow! Thanks! You’re my hero, this was the bomb! Thank you! New to Weight Watchers. Love your recipes. I have celiac so I have to sub in gluten free items. I have done so in several of your recipes with great success. This is no exception! It was wonderful. Thanks so much!